Ao Skincare’s #6 Rewind Retinal (www.aoskincare.com), is a go-to night treatment for people who want glowing, clear, firm, resilient and smooth skin at any age. 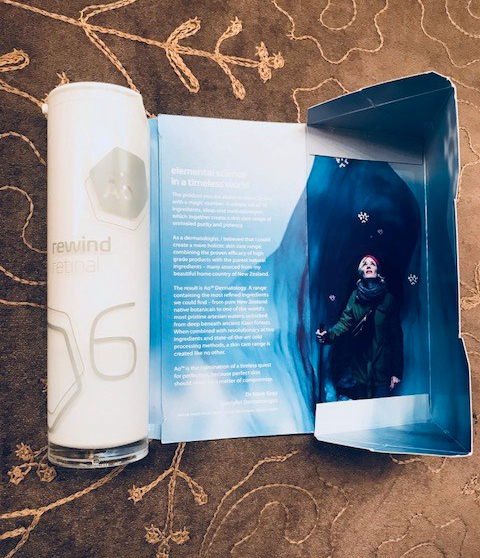 Introducing #6 REWIND RETINAL from AO SKINCARE of New Zealand. Retinal (retinaldehyde) is different from retinol. It’s a form of Vitamin A that is more potent that retinol, and it’s the star ingredient on this award-winning formula with multiple age-defying benefits from AO SKINCARE. Reducing the appearance of fine lines, wrinkles, and hyperpigmentation without irritation are just a few of the things this pristinely formulated product is proven to do. Users of #6 REWIND RETINAL also report improvement in their skin’s clarity, texture and firmness, not to mention and all-around “glow.” The Formula features a special botanical antioxidant booster, bakuchiol, which is a vitamin A analogue that helps the retinal work even better for your skin. 1. Astaxanthin-a marine algae-derived super0antioxidant that is 6,000 times more potent than vitamin C.
Totarol, derived from the New Zealand totara tree and a super antioxidant three times stronger than vitamin E.
Sodium hyaluronate for deep hydration and plumping of the skin. What makes this particular brand stand out from other retinal products is the fact it is an example of “raw”skin care at its best. The ingredients of #6 REWIND RETINAL from AO SKINCARE are never heated. Instead, a special cold processing method is used to create an emulsion without the use of heat so the active ingredients and delicate botanicals spotlighted in this formula retain their full potency. I’ve been using this product for two weeks and already I notice a smoother complexion. This is important to me as I age, as my skin seems to become dry and congested during the winter months. It’s packaged very nicely in a shapely box and looks fabulous in your skin care caddy in your bathroom. All you need to do is dispense one pump of #6 REWIND RETINAL and smooth it over your face gently including your eye area. The trick is to use it only 2-3 times per week until your skin gets used to its strength, then and only then, can you use retinal daily. This formula is your ticket for radiant, resilient skin at any age. The products are built on these key premises: delicate, high-performing botanicals and pure artesian water; super power active ingredients, plus botanical boosters that enhance the performance of these ingredients that all adds up to refined, healthy and beautiful skin. MSRP $119.95. For further details on #6 REWIND RETINAL and to purchase, visit www.aoskinacre.com.